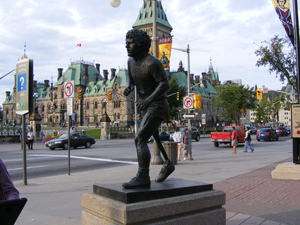 90 Wellington, next to the Terry Fox Statue across from Parliament Hill. Outside of Capital Information Centre. Canada’s capital is best explored on foot! Your knowledgeable and passionate guide will lead you on a leisurely walk around Ottawa’s most famous monuments and locations that explain the city’s colourful history, its larger than life political characters, graceful architecture and places tourists often don’t see! This tour is the perfect opportunity to get to know Ottawa’s past, present, and future with an entertaining and educational experience. Ottawa Walking Tours can customize tours to meet the needs and interests of any group. Please contact us for details and to start planning your next Ottawa Walking Tour. We are also wheelchair accessible.